I’ve been away from the blog for a couple of weeks as I was wrapping up my paper for this weekend’s meeting of the Society for the Scientific Study of Religion in Indianapolis. I’m presenting on the idea I’ve been exploring for the last year: how evangelicalism is changing form from one based on Industry Evangelicalism to one based on Identity Evangelicalism. I’ll try to summarize the paper in another blog post once I see how things go on Friday. After laying out some of the conceptual arguments I’ve presented here before, I contrast two memoirs. The first, Mark Driscoll’s take on the building of Mars Hill (Reflections of a Reformission Rev), contains many indicators of evangelical structure, separation from others, authority and charisma, and internal control. To say it was hard to read is an understatement. It’s more accurate to say that I suffered through it and felt relief when I was done in the same way one feels when you stop hitting yourself with a hammer (that’s a Driscollish subtle turn of phrase). 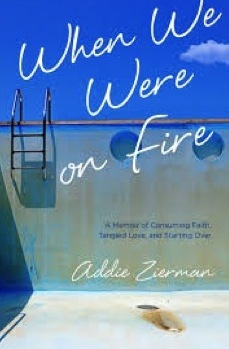 Then I got to read Addie Zierman’s When We Were On Fire. I had decided that I wanted to read a memoir from a millennial evangelical as my Identity example and had several to choose from, but honestly felt led to go with Addie’s. Addie tells the story of what it was like to grow up immersed in evangelical subculture in the Chicago area in the 1990s and 2000s. There is much that is familiar to other evangelicals: See You At The Pole, What Would Jesus Do, True Love Wait, Missionary Zeal, Rock Music will ruin your soul, Three Minute Testimony, Summer Missions, Controlling Authorities. In short, she grew up in the world that Mark Driscoll wanted to establish. And yet something wasn’t quite right. One of my favorite passages has her with her mother right after Amy Grant came out with her crossover hit “Baby, Baby” which ran shivers through the evangelical community of the day. She shook her head at the silliness of the whole thing, but you stared out the window, silent, thoughtful. You were born to a world within a world, and suddenly you could see the marked boundaries. You could see that there was an in here and there was an out there and between them, there was a yawning chasm. You could see that it was big enough to swallow you whole (20). There’s so much in that one passage. The world in here and the world out there and the chasm between. The book reflects her search for self that can navigate that contested space. She is surrounded by a subculture that has clear definitions of reality (even when she knows that there are other perspectives) and people who have put a priority on maintaining those definitions (the tightly structure missions trip and those who work for it seem to revel in extreme and draconian stances). Wherever she goes, whether to a good Christian college or to teach in a mission school, she seems surrounded by people playing along. She finds it difficult to be herself, expressing doubts, asking questions, living life. Where many others just quietly drift away from the evangelical world, Addie tries to find her faith in ways that don’t stifle her identity. It’s not easy and there are some dark periods of the book, but it’s clear that she’s never that far from what she believed “when she was on fire”. Where Driscoll plays with ridicule and a forced certainty, Addie asks questions. She tells her story even with the dark moments because that’s the reality (while he still claims to be victimized by others). As I finished Addie’s book, I found myself very hopeful about millennial evangelicals. They aren’t abandoning the faith, they are trying to live it honestly. It’s just that Industry Evangelicalism makes it so hard to do so. The takeaway question for me, the one that I’ve been wrestling with over the last week or so, isn’t about millennials at all. It’s about people like me. Why is it that my generation thought so little of prioritizing evangelical cultural expectations over an authentic sense of self? Why did conformity to rules and standards limit the ability to recognize grey areas? Why did we go along with structures that sometimes bordered on the repressive? And what are the lingering obstacles to healthy Christian discipleship that result from all that? Christ is not static or an end result. You are not suspended in grace above the fray of life. You are looking at God through a kaleidoscope. Your life moves, and the beads shift, and something new emerges. You are defining. Redefining. Figuring it out all over again. You are in motion, in transit, in flux. You will be sad. You will be happy. You will love and doubt and cry and rage, and all of it matters. You are human, and you are beloved, and this is what it is to be Alive (239). Nothing I can add except a hearty Amen.